The villa impresses with an oceanfront infinity pool, gorgeous kitchen, beautifully appointed bedrooms, and en-suite bathrooms with a private tropical garden. Added highlights include personal Thai chef and in-house concierge. Sleeps 8. An ornate wooden door greets you at the villa and opens onto a serene garden courtyard. How's that for a welcome? Inside, find a huge open living space, set beneath vaulted teak wood ceilings. Drop your bags, kick off your flip-flops, sink into one of the bespoke chairs or sofas to start your vacation with a hearty dose of doing nothing at all. An LCD TV with DVD player and satellite will keep you entertained between bouts of sunbathing and poolside lounging. Pick your soundtrack: the villa has a high-end surround sound system with indoor and outdoor speakers. The contemporary kitchen gleams with top-of-the-range Smeg appliances, including a coffee machine, two ovens and a wine fridge. Though your chef will make primary use of this space, it makes a great spot to gather in the mornings for pancakes and coffee at the supersized kitchen bar. The villa also has a 10-person dining table for sit-down meals and planning day trips. Floor-to-ceiling glass doors lead to the outdoor patio and pool deck with beach access. 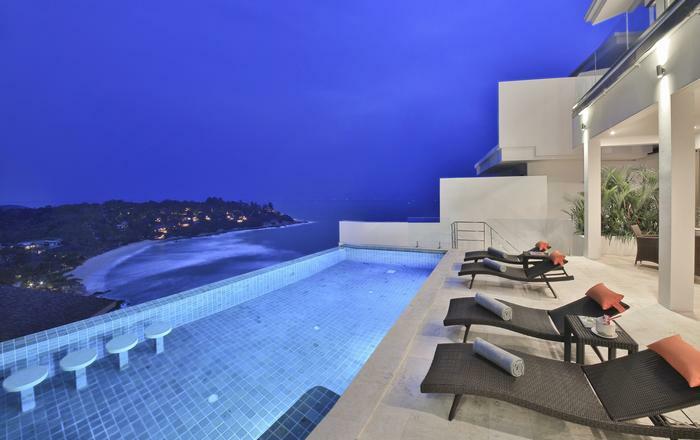 Sigh over the views and sip margaritas around your oceanfront infinity pool. While the adults relax, little ones can splash and play in the kid-friendly shallow section. The pool deck has plenty of sun loungers, parasols, cushioned couches, and a canopied "cuddle chair" for a romantic moment. Fire up the grill for a Thai-style BBQ, then share your feast around the pool deck dining table. In the evenings, this idyllic retreat offers a prime spot to watch Samui's dramatic sunsets. The sound of the ocean will lull you to sleep in each of the four elegant bedrooms, furnished with serene tones and teak wood vaulted ceilings. Ocean views, plush king beds, and open access to the pool deck add luxury and convenience to the two master suites. Two rooms with two twin beds in each (with two extra pullout beds available for an extra fee) open up to a tropical garden courtyard with outdoor seating. Both rooms have two twin beds (plus a pull-out bed), and ample wardrobe space. Along with a flat-screen LCD TV and DVD player, all bedrooms have their own chic en-suite bathroom boasting an outdoor rain shower in a private tropical garden, indoor shower, double vanities and dressing areas. 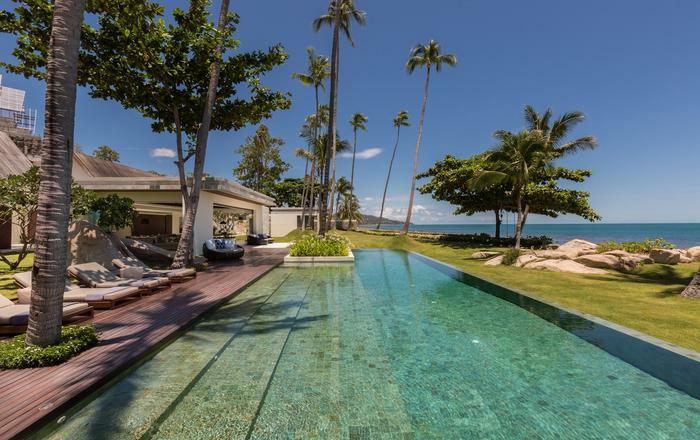 Located on the west end of Bang Rak Beach on Samui's north coast, the villa sits on a quiet part of the bay in a great central location. Enjoy endless views towards the island of Koh Som and Koh Phangan, and spend mornings watching local fishermen set out their nets along the shore. Numerous restaurants are walking distance, from fine-dining to local Thai street cafes. The nightlife of Chaweng Beach is just over 10-minutes away when you feel like a change of scene, while Fisherman’s Village is only a couple minutes' drive. Fantastic five days girls trip at Baan Capo September 2016. 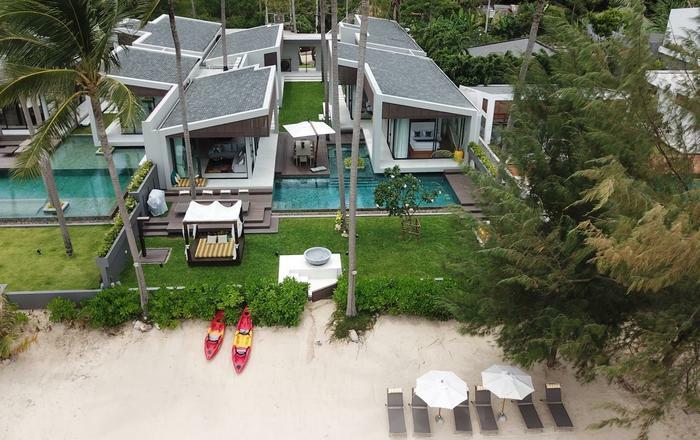 Straight off the hustle and bustle of a main road, as soon as you step past the entrance sign of Baan Capo, you enter the serenity of a luxury villa complete with well trained team of service staff ready to cater to your every need. Four private rooms in total - We had two of the rooms converted easily into three twin beds, perfect for additional adults or kids. The third bed is on the floor, no frame. The two front rooms are extremely spacious with floor to ceiling windows that offer a spectacular view of the ocean and sunsets. Every room was beautifully decorated, centered around the common area. Staff very attentive and took care of us wonderfully. The pool is divided into two sections, perfect for younger kids. Private instructor for group yoga sessions, healthy yet scrumptious food requests and daily simultaneous massages completed a superbly relaxing girls retreat! Baan Capo is the most wonderful holiday accomodation imaginable. From the minute Meen and Jack open the front door to greet you to the tears on departure the place is pure pleasure.We were a party of 6 there to celebrate Dad's 60th birthday with our adult kids. Natalie helped organise a fantastic birthday with cake and decorations. The cocktail making class was a true hit....the guys were professional and great sense of humour....we really did learn to make the best drinks. So sad to leave the luxury and peace. This is the perfect place for a group as there is ample space to have private time. I recently stayed at Baan Capo with a group of friends and I must say, it was absolutely stunning. The front door is right against the major road that circles the whole Samui which was extremely convenient for sightseeing. We walked in and I immediately felt awe and admiration. As soon as the doors closed, all the sounds from the busy road just disappeared. What you’re left with is the beauty of the house and within steps, you’re stepping into the ocean. The décor is an excellent balance between traditional thai and modern beach house – something you find in Conde Nast Vacation Homes Edition. The house is equipped with an excellent sound system for both the outdoor pool area and indoors, and not to forget the professional coffee machine . Jack and Min (housekeepers) are very accommodating. They do everything you need, from laundry to blow up floaters to making fantastic thai food. We has such a good time there that we barely left the house. I loved Baan Capo and luxury it represented, I hope to go back soon! Baan Capo is beautifully decorated, highly equipped and has absolutely everything you could ever need for a perfect vacation. The location, right by the peaceful beach, unbeatable! This was one holiday I will not forget. 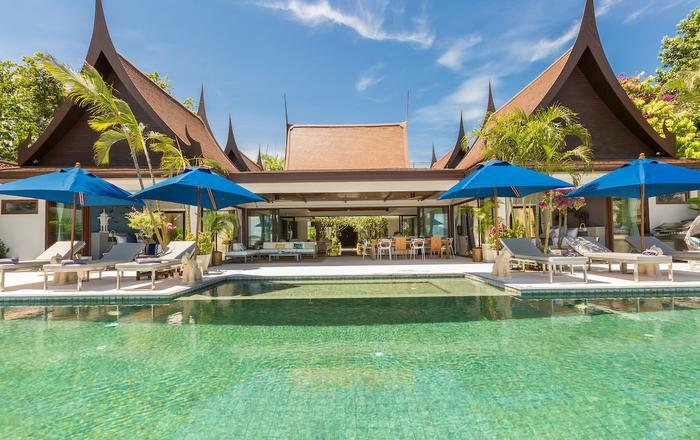 Baan Capo is a very beautiful Beachfront Villa with a large living space including lounge and dinning, four charming bedrooms, a lush tropical garden and a stunning crystal blue private swimming pool. 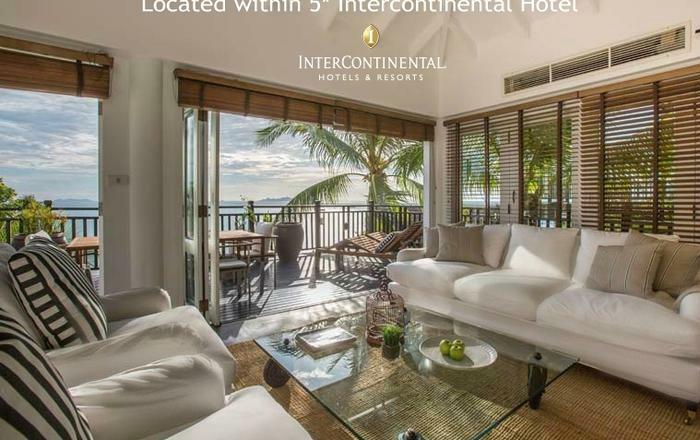 It lies on the Bang Rak Beach along the northern shore of the Koh Samui island and only three kilometers away from Koh Samui Airport. Set a mere 10 seconds walk from a beautiful stretch of white sandy beach. You may also have your own Maid and Chef Service. My friends and I also had a wonderful BBQ with a band and shows here. It is an amazing experience. We are only sad that we couldn't have stayed longer. Hopefully, not too long before we can be back. 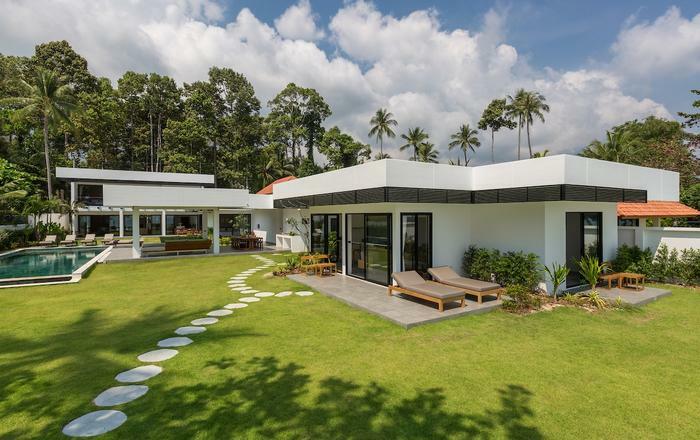 This villa is ideal for relaxation and fun. I strongly recommend it to YOU! 简洁 舒适 明亮的设计风格，还有超美的海景都很令人难忘。很值得一去。 concise comfortable bright Style, and the beautiful view of sea. It is worth to go. A quiet house with both public lounge and private bedrooms. Fabulous decoration in Thai-style and garden foyer. What a day if you relax yourself in the swimming pool facing the sea enjoying the perfect view of sunset, while kids can have fun in the other kids pool. At night, a leisure party with home-made cuisine by the Chef at your own kitchen, with considerate service staffs and a surprise of the fire show at the beach... Yeah, just feel like home that I've never gone far away. A journey that you can be totally released from pressure but refilled with recreation. Well, isn't that the definition of a wonderful vacation?! I've just had an excellent vacation there. When is yours coming next? The house is just on the beach and swimming pool is opposite to the sea. So beautiful! Rooms are clean and ample and suitable for party. If you love sunshine, ocean and beach, this would be a beautiful place where you love to stay. The villa was really excellent! The rooms were very well decorated, with stunning sea views. the bed was cozy.the service was good.Absolutely incredible place to stay. Highly recommend this villa! It's the best place on Samui! We will be back definitely ! 我們在這待了六天五夜,villa擁有無敵海景，貼心服務, 舒適床舖,寬敞浴室,兒童泳池....設備非常新穎,也一應俱全! 邦來客海灘不像查汶海灘那麼吵雜,若你想要有寧靜假期,這裏是最好的選擇!